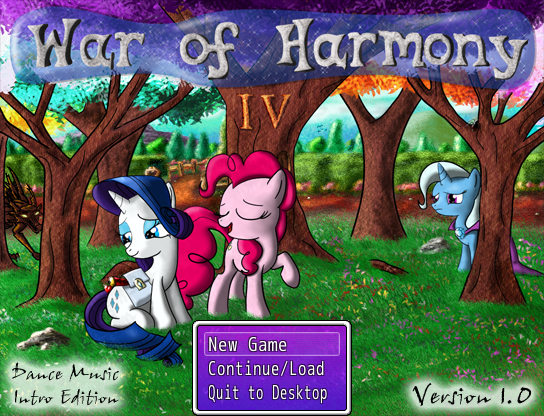 Unlike a good portion of fangames (the vast majority of which are relatively simple Flash games), War of Harmony IV actually has somewhat of a plot, albeit one that vaguely resembles a somewhat generic piece of "epic" fanfiction. 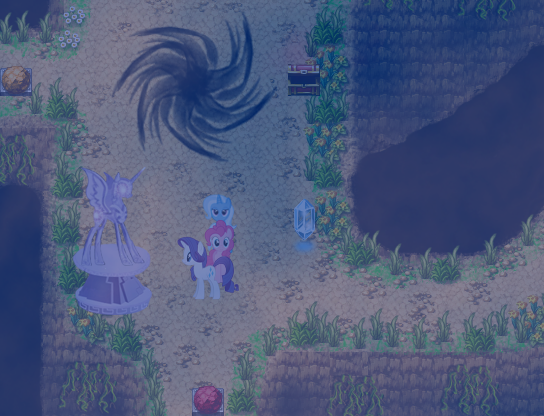 It starts off with Rarity and Pinkie Pie venturing into the Everfree Forest to find their missing friends and shortly thereafter throws them into a "Lunar Republic vs Solar Empire" conflict, with Sethisto's non-dragon waifu being involved somehow and using her "regretful victimized woobie" persona. More can be discovered about the plot by following the various alignment paths, if the player decides the game warrants another playthrough. Thing is, completing one playthrough takes much longer than one might expect, thanks to some rather annoying bugs that can obscure the screen with gothic script upon entering a room or even give the player an entirely unusable save file after using a certain save prompt that appears shortly after beating a boss. Using multiple save files per game and saving every couple minutes is a pretty good idea unless you're some kind of especially determined sadomasochist. As of now, I've already had to restart the game several times and spent much time replaying large sections that could have been spent advancing the plot if things worked properly. Touching a statue with glowing eyes probably isn't the brightest of ideas, but Rarity doesn't have much of a choice here. Regardless of its issues, WoH IV can be fairly enjoyable on those occasions when it is working properly. It places far more of an emphasis on dialogue and exploration than grinding, which is quite a relief because the combat tends to be somewhat unsatisfying. Bosses tend go down far too quickly, and when combined with the overabundance of health and mana restoration areas the player is rarely in any real danger, which is quite disappointing even for a RPG not focused on combat. I kind of got the impression after playing for a while that Marshall's intention is more to tell an interactive story than anything else, which is fine with me because War of Harmony IV manages to accomplishe that goal for the most part (notwithstanding a few grammatical errors). As with the majority of RPG Maker projects I've seen, this one makes fairly extensive use of the default tilesets and music, but stands out by using them in a tasteful manner and not taking advantage of the default enemies (which get really old after you see them in a half-dozen games). Mixed in with the soundtrack are several original pieces by Som3thingUX, which are pretty good but don't stand out as being particularly memorable. There's also some minor visual effects, such as drifting fog and blood rain, that aren't really impressive from a technical perspective but are fairly nice touches, even if the blood felt a bit out-of-place in this type of game. To put it bluntly, I have rather mixed feelings about War of Harmony IV. It's not bad or anything like that, but some stability issues prevented me from getting far enough into the project to decide whether I liked it or not. Until a bugfix release comes out, I'll just slap a temporary 5/10 on the project and re-review it once Marshall is able to fix it up a tad.